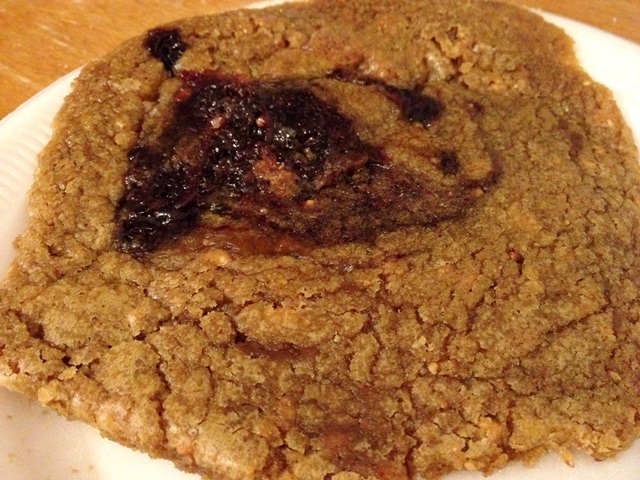 A shout-out to all vegans, gluten-free and health conscious out there, Cookies and Scream is surely a place to visit when you are in the vicinity of North London, Camden Town. Following the likes of Maggie Q, one of the more well-known vegan celebrities, there has been an increasing number of 'vegans' in today's society. In a nutshell, 'vegan' refers to 'non-dairy vegetarian' whereby some even opposes the consumption of eggs. The underlying principle is that 'Man should live without exploiting animals'. The benefits are well-obvious, low-fat and cholesterol amongst many but I do love my dairy products like cheesecake and ice cream too much for me to pursue a vegan diet. Those unfamiliar with what exactly a gluten-free diet means - You are not alone. I was not too sure myself until I did some research. Gluten is basically a protein which is found in wheat, barley, rye, malts among others and is usually used as a food additive in the form of a flavoring, stabilizing or thickening agent. What many do not realise though is that even though a product off the shelf claims to be 'gluten-free', it generally indicates that there is a supposed harmless level of gluten rather than a complete absence. Anyhow, without getting too 'geeky' over 'vegan' and 'gluten-free', I suppose it makes more sense to know what is the good deal 'Cookies and Scream' has to offer! We were completely spoilt for choice while seated at the 'Cookie Bar' (yes, you read me right, one would have thought that it was a takeaway counter, but there were a couple of seats so you could actually 'dine-in' and enjoy fresh bakes while sipping your coffee!) and we deliberated for a good 5 minutes on what to order. The lady boss was more than kind to offer her most honest opinions and suggestions and first up was this almond and plum blondie! After reading the above label pinned to the 'blondie', the first question was 'What exactly is your version of a bakewell tart?' Being a very popular and common dessert featured even in Michelin-starred restaurants' menus, I must say I was truly impressed with this 'blondie'! Good quality plum jam was being used, which was more like plum compote (that said, do not expect whole pieces of plum fruit but more like pieces of it). 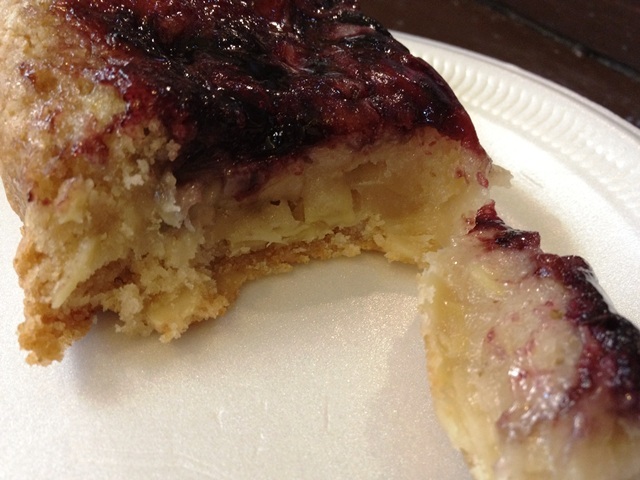 The 'X-factor' of this 'blondie' was the gooey, sticky almond base. What made me fell in love with this dessert was that despite it being very sustaining in flavour, it was not overwhelmingly sweet, owing only a slight tinge of sweetness to the surfacing layer of plum jam. 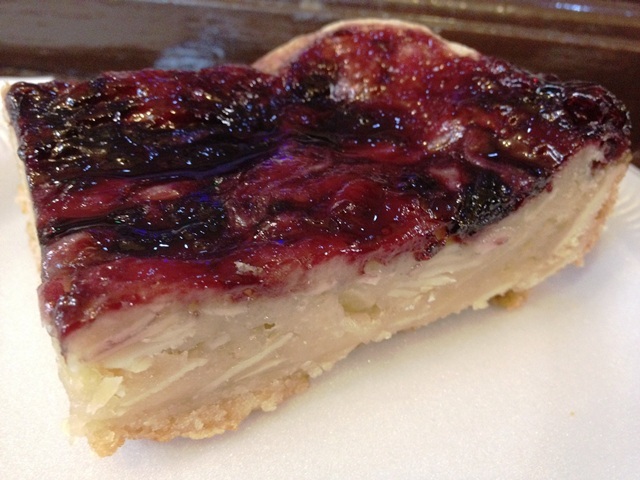 The thin crust was crisp and complemented the generously packed almond flakes in a sticky 'puree-like' base perfectly. It was definitely a very unique variation to the classic bakewell tart, in terms of both flavour and texture, though be warned that it can be quite a dense bake (making you feel quite full), so some coffee and tea would certainly go well with it. The above label kinda said it all about what made this 'sandwich' special. 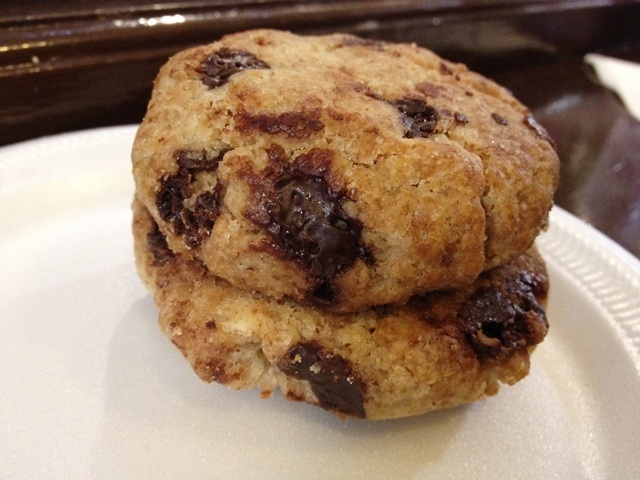 It came across as more of a 'chocolate chip scone', presentation-wise anyway, until we sank our teeth into this sinfully rich indulgence. Not exactly certain if we got it completely off-cue on the order, but we could not quite taste the vanilla frosting that was supposedly sandwiched between the two chocolate chip cookies. 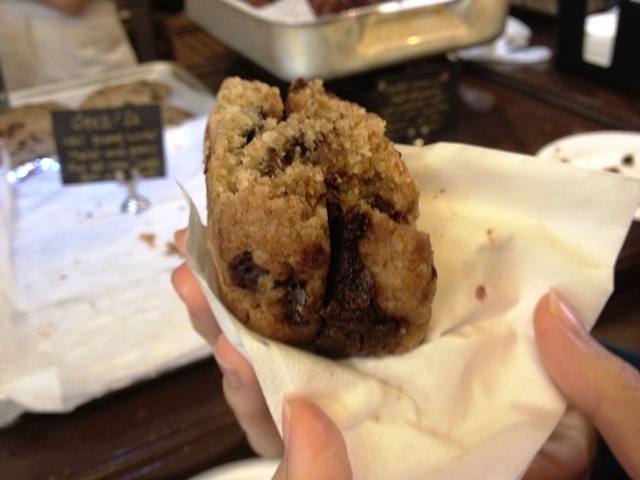 Nonetheless, it was a very unique creation, with the chocolate chip cookie crumbling and melting in your mouth with each bite. On hindsight, we are definitely returning to give it another shot, if not for the vanilla frosting, then the cookies sandwich! 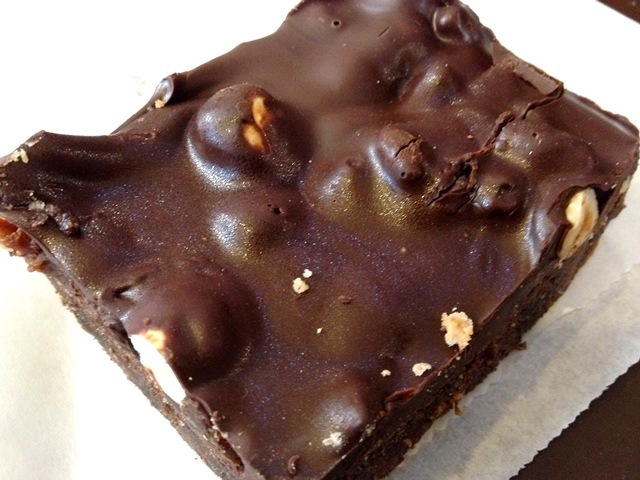 One of Cookies and Scream signature products was actually the 'Gosh' Brownie which saw them being accredited with the 'Great Taste Gold Award' last year. There was a sampling plate before this tray of rich and decadently sinful brownies. Being egg and gluten-free, it was amazing how moist, squidgy and chocolaty the brownies tasted. However, purely as a matter of personal preference, we were inclined towards the more gooey sort as tasted at Homemade in Nottingham. We figured that it did not seem too fair for us to provide a verdict considering it was only a sample we tried, so we are giving this a miss but brownie lovers, be sure to order a slice. So while we sat and sipped at our cup of Americano, we saw the lady boss preparing the mixture for donuts! For some odd reason, I always cave in when a donut temptation comes along and resisting freshly baked donuts is certainly a taboo for any foodies. While we waited for the donuts to be baked (yes, all donuts served are baked and not deep-fried like what you get from donut-chains such as Krispy Kreme or Dunkin' Donuts), I tried to get some photos of the place with the phone. A good note to all who intend to visit the Camden Town area is to make sure you have sufficient amount of cash for most places take cash only. It took me quite some time to figure out the nearest free cash-point despite being told that it was approximately only 2 minutes walk away. But guess what, there was no better way to return to Cookies and Scream with some freshly baked jam and cinnamon sugar donuts awaiting! As a matter of kind gesture, my lady was offered a complimentary sampling of an iced vanilla drink while she waited for my return to food-taste the donuts! Freshly baked jam donuts from the oven! Some cooling time had to be allowed though before the casting of cinnamon sugar on the surface. As the Chinese saying goes 'Good things come in pairs', these freshly baked warm donuts were screaming 'Eat Me' literally. As the donuts were baked in oven rather than deep-fried, it certainly took the guilt away. 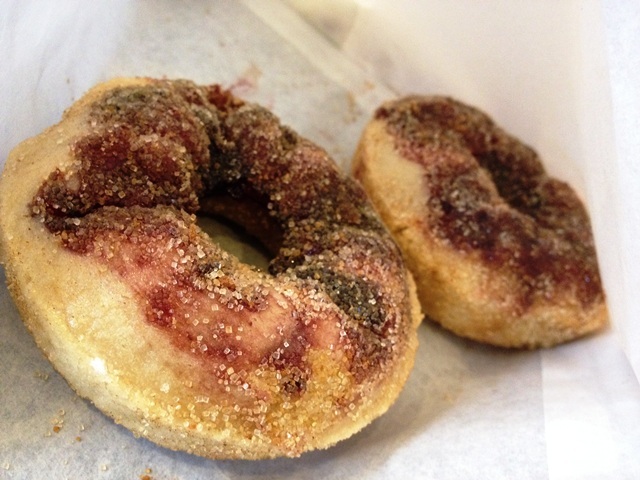 Light flours were used which gave the donuts a beautifully moist and soft texture. The aeration of the dough was flawless with the right choice of flour to give the donuts a somewhat fluffy texture on the inside. We deliberated while at writing and decided that it was in our terms a 'hybrid of conventional donut and sponge cake'. Like the rest of the other tried bakes, the donuts tasted mildly sweet and it was almost a perfect conclusion to our hunt for good food at Camden, only not quite yet. By then, we had definitely exceeded our stomach capacity for sweet treats. Thankfully, I decided to have this cookie bar as takeaway for supper, otherwise I would have missed out on one fine treat! Generously packed with hazelnuts, raisins and thick chocolate, these 'wookees' sure got the 'WOW!' factor checked. Plain simple as it looked, the variation in textures and tastes was well worth reminiscing. The soft-chewy raisins embedded in a thick slab of rich and dense chocolate, coupled with crunchy hazelnuts sure made us gave a double thumbs-up. 'Our wookees are out of this galaxy' - I would have found it a cliché, but these ladies sure got the goods to deliver. Just as we were about to leave the cookie bar, the lady boss was most generous to actually give us a free cookie! We were contemplating on whether to get a cookie as takeaway to add onto our 'to-try' list and this kind gesture certainly took us by surprise! By the time we consumed the cookie, it was almost midnight and by then, the oil from the peanut butter had seemingly oozed out, leaving the cookie rather 'soaked' and 'dampened' but the taste was 'oh-my-God' orgasmic. This is a 'MUST-TRY' for any peanut butter lovers, guaranteed not to disappoint. The taste of peanut butter was evenly distributed throughout the entire cookie, so a bite off any corner will still get you that rich taste. We regretted not trying it earlier when the cookie was still fresh to taste it at its prime, but there is always a next time. The generous gesture was really well-appreciated and while we truly enjoyed our visit to Cookies and Scream due to the fine quality food they offer, it is the exquisite hospitality that sums up the dining experience on a perfect note. Though it may not be presented in the fashion of a posh restaurant, the impeccable service was everything one could ask for. Judging by the number of regulars who dropped by to get their sweet-tooth fixes, cups of coffee and tea, it was not hard to imagine why. It is such genuine and localized hospitality that leaves customers with fond memories of the place with a longing to revisit. Would certainly love to see more of such eateries out there!